I'm going to preface my review by saying I didn't even read the blurb before beginning By a Charm and a Curse, so I was pleasantly surprised by the content, especially with this being Jaime Questell's debut novel. I read the book cover-to-cover in one sitting. This was an original take on the carnival setting, and the title fits the novel perfectly, summing up how the carnival functions – by a charm and a curse. Emma returned to stay with her father, while her mother is helping a village in an underdeveloped country. Emma misses her mother, feels the divide of distance and time with her old friends in this town – it's as if they fell out of knowing each other, growing apart. Emma's thoughts are swirling as she and her friend, Juliet, go to the carnival, in a town that normally only has football and Wal-Mart as entertainment. Emma struggles to connect with her friend and find the good about being at her dad's home, and this leaves her as the perfect target for the Boy in the Box. The story unfolds in Emma and Ben's narration, seeing a wide view from the get-go. I had no idea what was going to happen next, how Emma would be drawn into their world. I actually felt a wave of panic for Emma as she goes through her ordeal, then the desolation of her circumstances. This portion felt very real, and I applaud the author for eliciting so many emotions from me. Emma's thrust into a world where she cannot trust anyone, yet she is a the glue that holds the carnival together – the curse to their charm. There is a side cast of characters who were intriguing, in a wide array of personalities, from sympathetic to apathetic, many taking Emma's sacrifice for granted. There are bullies, mothers with their own agendas, supportive friends, and many middle of the road folks, making up a diverse carnival feel. Emma was a strong character. Ben was a comfort, the warmth Emma needed to survive what she was going through. Both Emma and Ben are good people, yet managed to sound equally unique in their narration, showing their world through different lenses. The world-building and plot are the focus, with an underlying romantic thread, which has its own limitations, as well as several subtle romantic entanglements by the side cast of characters. This delicate balance is perfect for the reader who looks for the romance, as well as the reader who is more plot-focused. I was surprised at how much I enjoyed this novel, and highly recommend it to both teens and grown adults who are looking for something unique. 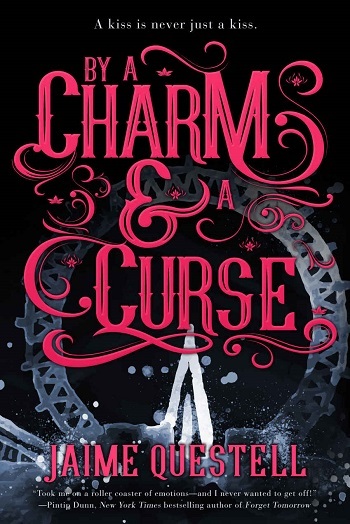 Reviewers on the Wicked Reads Review Team were provided a free copy of By a Charm and a Curse by Jaime Questell to read and review.